El III MINEX Europe Mining & Exploration Forum se celebrará en Skopje, Macedonia, del 12 al 14 de Junio de 2018, bajo el lema “Sustainable development of the Western Tethyan metallogenic resources”. El Fórum reunirá a las compañías mineras, directivos de las Administraciones regionales y de la UE, inversores, consultores y compañías tecnológicas para discutir las oportunidades y los retos del desarrollo de una minería sostenible en los países del cinturón metalogénico del Western Tethyan. Se expondrán proyectos mineros que se desarrollan en los Balkanes, Bulgaria, Turquía, el Cáucaso y Asia Central así como las tendencias innovadoras en exploración, extracción, proceso, gestión de residuos y comunicación social a través, sobre todo, de una mesa redonda sobre “Economía Circular y Sostenibilidad en Minería”, a la que CONFEDEM ha sido invitada. El programa, en su última versión, se puede ver aquí (en inglés). 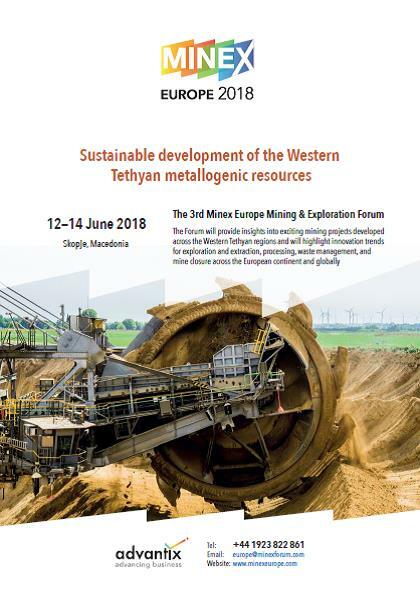 Organised under the central theme “Sustainable development of the Western Tethyan metallogenic resources” the Forum will provide insights into exciting mining projects developed across the Balkans countries. The Forum will also highlight innovation trends in exploration and extraction, processing, waste management, and mine closure across the European continent and globally. Over 200 international delegates are expected to attend the Forum from the Balkans countries, EU, Canada, USA and Australia. With Euromax Resources looking to develop the Ilovitza gold project, Solway Group’s Bucim copper/gold mine, Genesis Resources Plavica gold project at feasibility and the recent $400m purchase of the Sasa zinc project by Central Asian Metals, Mining sector in the Republic of Macedonia offers potential growth prospects for the foreign investment in the mining sector. When you factor in all the activity in neighbouring countries across the Tethyan Belt, the Western Balkans are a veritable mining and exploration hotspot. The Forum will provide platform for meeting senior executives from mining companies operating projects in the countries across the Tethyan Belt. • Todd Romaine, Vice President, Corporate Social Responsibility, Nevsun Resources and many others. I enclose links to the forum brochure, preliminary agenda, delegate and exhibitor registration form and look forward to confirming your participation in at MINEX Europe 2018 Forum.